When last we traveled to Vietnam, I fell deeply in love with a tea set. My husband recognizes and has come to terms with this affair of the heart — after all, he is served delicious tea in said set. It all began with a typhoon. Our visit to Vietnam in November, 2013 happened to intersect with a typhoon that hit both the Philippines and Vietnam. We scrapped our initial plans to visit HoiAn and retreated up the mountains to Dalat for a week instead. When we returned to Ho Chi Minh City, we heard the danger of the typhoon had passed and we reset our plan for HoiAn. While there, we met with heavy rains and resulting flooding that created new and amazing adventures in touristry. We spent our first day walking around the quaint town despite the pouring tropical rain. We kept ducking into shops and cafés to escape the continuing deluge. 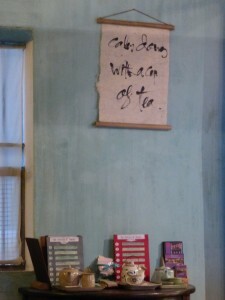 It was during one of these heavier rains that we found a delightful tea salon. I was drawn in by the tranquil robin’s egg blue walls and the sight of teapots lining a bookshelf on the wall. The shop, Reaching Out Tea House, is staffed by the deaf and/or mute. The tables are set with visual ways of communicating with them and they were absolutely amazing. I learned that all the cups, teapots, linens, and other decor was created by the Reaching Out program and was invited to peruse their retail shop one street over for souvenirs. The retail shop houses their array of ceramics, metalsmithed items, and quilted silks. Behind the storefront, I was invited to view one of their workshop spaces. The staff are all disabled in some respect. People without limbs, deformed parts, speech and auditory impediments, anything that may prevent them from earning a living in many jobs, have developed their skills in the fine arts. As a jeweler, ceramic, and fiber artist, I have done many of the activities I saw, so I have a great appreciation of their skill. Plus, knowing that 100% of all purchases go directly to them to further build this venture, I felt it my duty to purchase from the shop. This retail shop is where I saw my celadon tea set. 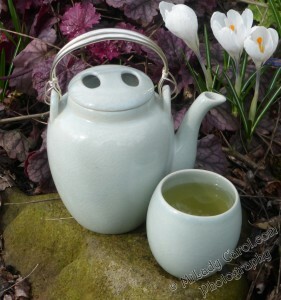 There are six cups and the teapot, all in the gorgeous celadon glaze that brings joy to my heart. I walked by it over and over while picking out gifts for loved ones, choosing some of the tea they sold, and enjoying being surrounded by hand-crafted wonderfulness. Eventually, I had to make this set mine. I love it and amazing tea is made and served in it. Next time you come by, sit and share a pot of Vietnamese tea in this hand-made tea set with me.